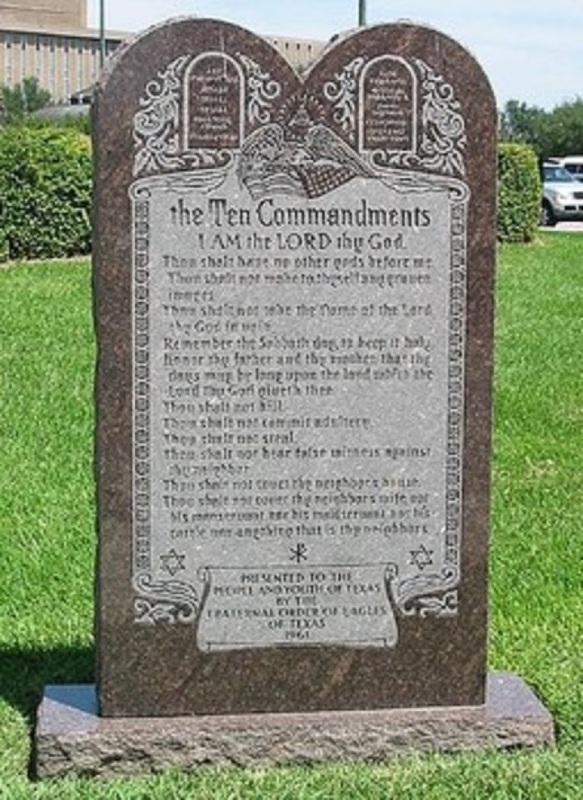 A judge in Oklahoma ruled that a Ten Commandments display erected on the grounds of the state's capitol building is constitutional and may remain at the public location. In his decision, Oklahoma County District Judge Thomas Prince wrote that the Ten Commandments display was one of many present on the Capitol grounds, each having their own blend of historical and spiritual significance. "Many of these monuments and plaques depict both the secular and spiritual history of Oklahoma," wrote Prince, who noted that multiple images of Native American spiritual imagery exists in the various monuments. "In short, the evidence demonstrates that the Ten Commandments Monument is one of many monuments and works of art, all rich with symbolism (some religious), that dot the Capitol Grounds." In 2012, a Ten Commandments monument was installed at the grounds of the Oklahoma City Capitol Building, having been paid for with private donations. The display came three years after a bill was passed allowing for monuments like the Decalogue to be erected at the public facility. John Morrison, administrator of the state's capital assets management division, told local media that no government funding was provided for the display's creation. "The state didn't do anything on that … It was all private donations," said Morrison to newsok.com in November of 2012. The monument measured about six feet tall and three feet wide, and was placed on a base approximately ten feet from the Capitol building's north transept. In August 2013, the Oklahoma chapter of the American Civil Liberties Union filed a lawsuit on behalf of a Baptist minister arguing that the display was unconstitutional. The Capitol Decalogue garnered more attention as the group American Atheists later filed a lawsuit against the display and a Satanist group lobbied to get a statue placed on the grounds, arguing equal access. The ACLU has thirty days to appeal the Prince decision, a move they will likely pursue as other proposed displays for the capitol grounds are put on hold pending the result of the legal battles. Brady Henderson, legal director of the ACLU of Oklahoma, said in a statement that his organization respectfully disagrees with Prince's decision. "The plaintiffs in this case do not seek the removal of the Ten Commandments monument from the State Capitol lawn because they find the text of the monument offensive, but rather because … it is offensive to them that this sacred document has been hijacked by politicians," said Henderson. "We will appeal this decision and ask the Oklahoma Supreme Court to find that the Oklahoma Constitution does not give the government the power to cheapen inherently religious texts." The Liberty Institute, which along with the state of Oklahoma defended the display in court, hailed the Prince decision. "This is just one more example of how the Ten Commandments monuments may be constitutionally displayed," stated Hiram Sasser, director of litigation at the Institute. "This is a great victory for the people of Oklahoma! Ten Commandments monuments are routinely upheld as constitutional across the country."